Accomplished professional violinist Cosima Luther’s biggest thrill is not when she performed live on American Idol with Janet Jackson and Christina Aguilera. It’s not her performances at the Academy Awards Governors Ball or with Stevie Wonder, Natalie Cole, and John Williams. It’s not her world travels performing in prestigious venues and not her gig conducting the Western States Honors Orchestra Festival in Colorado this month. So, what is Luther’s biggest thrill? “It has been by far the most rewarding and fulfilling thing I could ever imagine with music,” Luther enthuses, of her work with disadvantaged children in Los Angeles. Six days a week, Luther drives to Exposition Park in South Los Angeles to teach violin as the head violin teacher for Youth Orchestra LA (YOLA). YOLA provides free music lessons, instruments, and performance venues to 300 children between the ages of six and 17. Established in 2007, the program is offered through a partnership between the Los Angeles Philharmonic, Harmony Project, and Los Angeles Department of Recreation and Parks. Students apply for admission and, once accepted, remain with the program through high school graduation. The children study with professional musicians on their respective instruments and are placed into beginning, intermediate, and advanced orchestras. Luther conducts all three groups. Although the program is intense, YOLA’s primary goal is not to raise classical musicians. Luther receives tremendous satisfaction from her students’ accomplishments. In essays for school assignments and college applications that they shared with Luther, students express how practicing violin changed their lives, taught them to complete homework, achieve better grades, and inspired them to apply to college. In fact, several YOLA participants have been awarded college scholarships. “I have had students say, ‘I’ve had no one to look up to all my life.’ ‘Thank you for being my role model.’ ‘You’ve shown me how to be a better person and achieve the things I want,’” Luther explains. 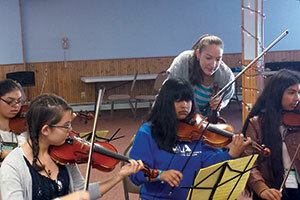 For many students, music lessons are the highlight of their week. Most walk or take the bus to Exposition Park for lessons. Luther hopes that YOLA leaders can find space to accommodate the 100 children on the program’s waiting list. Working with children is not new to Luther. She began teaching music at age 13 when her family opened the Rocky Mountain Fiddle Camp in 1999 in the mountains outside Denver, Colorado, where Luther was born and raised. She, her father Mark, and her brother Christopher, who both play violin, join other professional musicians in teaching non-classical forms of violin at the annual summer camp. Luther has also taught violin at Crossroads School for the Arts in Santa Monica, California, and served as conductor and director of the South Bay Youth Orchestra. Luther extends her teaching skills to Pepperdine as well, serving as guest faculty for the summer music program in Heidelberg, Germany, along with her brother, and at the Malibu campus, where she returns annually to play in the orchestra, an opera, or a musical. As a Pepperdine student, Luther solidified her identity and became a better teacher because of the diversity of students, experiences, and backgrounds on campus. “I felt very much at home there, surrounded by people with similar vision, values, and morals—fellow students who are hardworking, passionate, and had dreams to achieve,” Luther recalls. When not teaching, Luther is on the road performing in Europe, Asia, and North America with the Classical Concert Chamber Orchestra, made up of musicians from many countries. She recently returned from a three-week recording session in Poland and will perform in Italy in the fall. For Luther, music is a universal language. She describes a moving experience she had with a fellow musician in 2013 while performing in Latvia in which their only common language was music. Although she enjoys being an international musician, her thoughts are with her young protégés no matter where she goes. “The hardest thing about touring with the orchestra is being away from the students,” Luther says. Luther is passionate about music and puts her whole heart into everything she does.